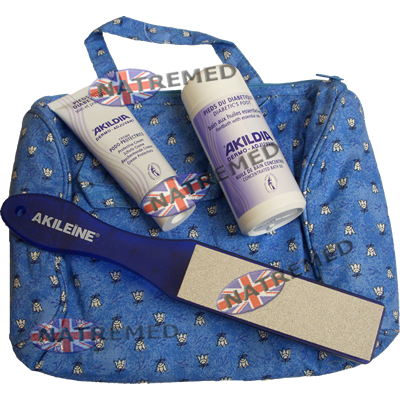 The Akileine Blue range of foot care crème's and balms are formulated to re-hydrate dry, cracked feet and heels. Soothe, repairs, reinforces and protects skin against harsh external factors. 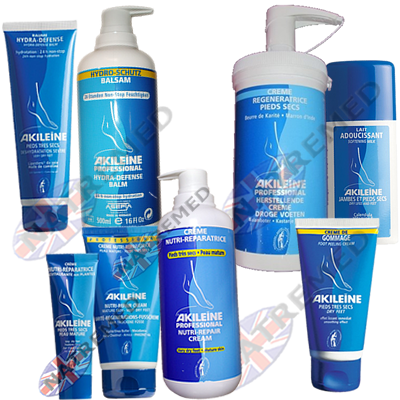 With Shea butter and many other natural plant extracts, Akileine Blue range intensively moisturize, nourish, smooth and protects dehydrated, dry keratinised and rough skin. 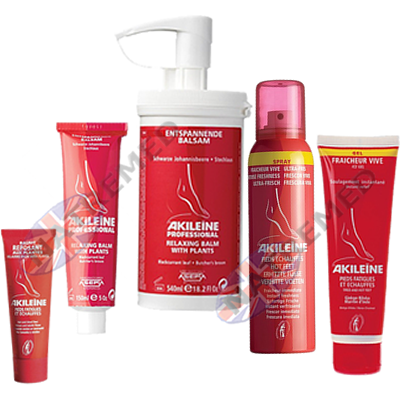 Akileine Red range of foot crèmes are formulated to decongest and soothe tired, swollen feet, inflamed by walking, heat or tight shoes. Provides a pleasant sensation, freshness and enhance blood circulation. 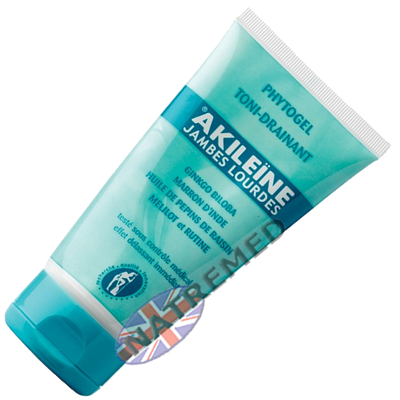 Non-greasy and provide a Non-sticky formulation of foot care products that are un-paralleled in the foot care industry. 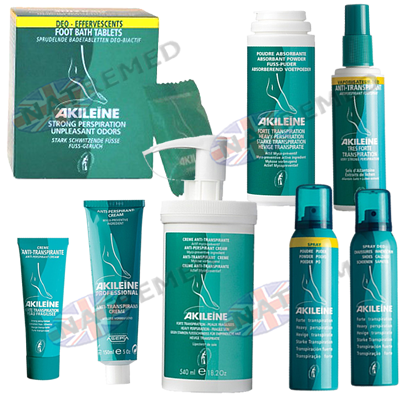 Akileine Green Range of cremes are used to regulate excessive foot perspiration (hyperhydrosis). The crème regulates the volume of perspiration from the very first application without blocking the skins ability to perspire. Everything you need to look after you feet. 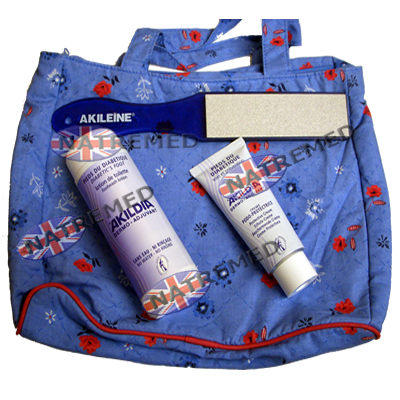 Akileine Winter Crème Prevents chilblains and frostbite, calms inflammation and itching. The crème also reinforces the natural hydro-lipidic barrier and helps the skin to fight the effect of cold helping it to stay supple and resistant. 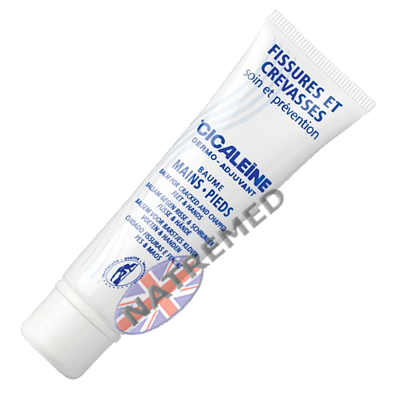 Cicaleïne Heel and Hand Cracks Balm is formulated to repair heel and hand cracks,The moisturising action is immediate from the first application, and feels considerably more comfortable. Visible results after 7 days, the number and depth of cracks is significantly less and there is a perceptible soothing effect. HEAVY LEGS. Made of active ingredients extracted from plants, these products drain, soothe and improve micro-circulation while refreshing and moisturizing the skin. Phytogel for heavy legs and swollen ankles. 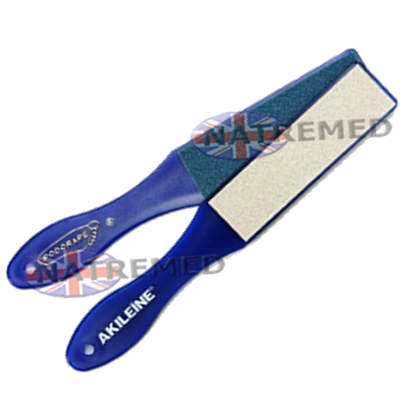 Reduces ‘Heavy Legs” feeling due to: heat, standing, excess weight or when flying. 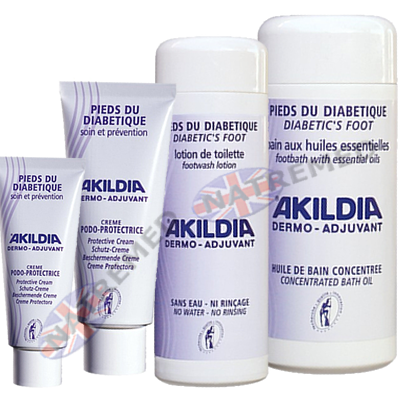 Akildia Crème is specially formulated for those who suffer from diabetes. The Akildia range Protects skin against harsh external factors. Prevents dehydration and limits the risk of hyperkeratosis. Preserves the skin’s barrier function and enhances tissue regeneration. File, Crème, Oil or Lotion.